Machine Plus utilizes 3D machining software (CAD/CAM) for its advantages with the entire CNC metalworking process. We understand that our manufacturing customers are faced with shorter lead times and the demands for lower prices. We use 3D machining software to help you overcome these challenges. Cost Effective- CAD/CAM software makes every machining job more cost effective to our customers. Machine Plus utilizes 3D software’s during the quote process so we can provide the best price to our customer’s up front. 3D CAD/CAM provides automation to maximize programming efficiency. Better Communication- Machine Plus accepts CAD models from our customers which streamlines the quoting process. 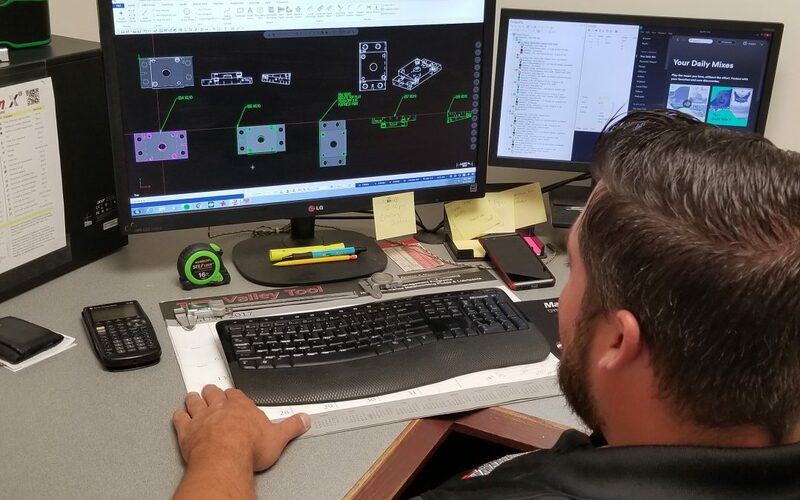 3D software packages allow us to set up the toolpath for machining projects and perform simulations that provides our customers with valuable information such as pricing breakdowns, possible issues, and cycle times. Reduced Cycle Times- High-speed machine tool paths deliver a variety of benefits that will reduce part cycle times. 3D CAD/CAM software allows for our manufacturing customers to deliver products to market faster. This technology advancement allows us to design faster, manage projects more effectively, conduct testing, and simulate parts faster than ever. The use of 3D software can increase machining productivity by as much as 50% ! Improves Quality – 3D machining software eliminates costly mistakes and waste. CAD/CAM software provides powerful simulation features that allow us to visually inspect the machining process. This presents us with any costly tool gouges and collisions before they reach the CNC machine. These simulations give back detailed information about the tool path, cycle time, part deviation, and more. Complex Parts Made Simple- 3D CAD/CAM software provides solutions to make complex machining jobs much easier than ever before. 3D software offers 4th axis indexing and rotary machining jobs that require tool paths and special post processing. Without it, this level of CNC programming is nearly impossible. This means we can take on more of your complex machining projects. 3D technology continues to advance and become faster, smarter, and easier to use. As a cutting-edge machine shop, Machine Plus is taking machining to the next level! Machine Plus LLC is a high-quality custom machining shop. We have years of experience in making metal parts for a variety of different manufacturing industries. We are dedicated to superior workmanship and attention to detail. Get in touch with us today to discuss your project. Welcome to Machine Plus! Where the Difference is in the Details!